ITF invited a delegation from China to the UK to talk about transport and in particular how the high speed trains are run. We travelled from King’s Cross St Pancras down to Ashford in the driver’s cabin… None of the delegation jumped up and down shouting ‘Yippee! I’m in the driver’s cabin on a high speed train!’ so I didn’t either. 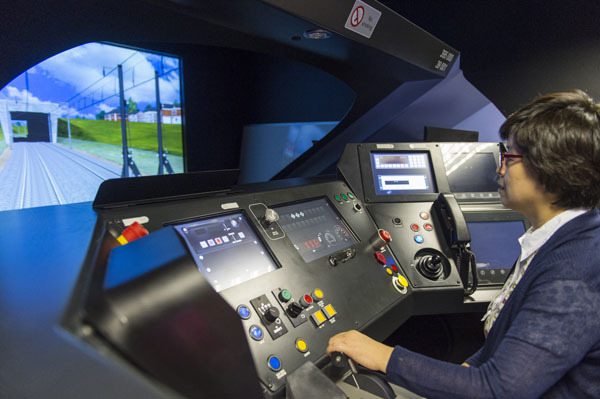 There is also a high speed train driving simulator at the Ashford base that occupies a whole room and is a lot more expensive than an Xbox. 2. Do not use any flash. Just replace the word ‘driver’ for ‘subject’ and those rules stand firm for most documentary photography. Without flash or interior lights the difference in light levels inside and outside the train are too much even for the human eye so any camera will struggle in this situation. If you want to see the difference between what your eye and your camera can see then just half close your eyes and look around; All the highlights and mid-tone areas are still there but the darker areas get much darker, too dark to see any detail. You can use this to good effect though to create drama. 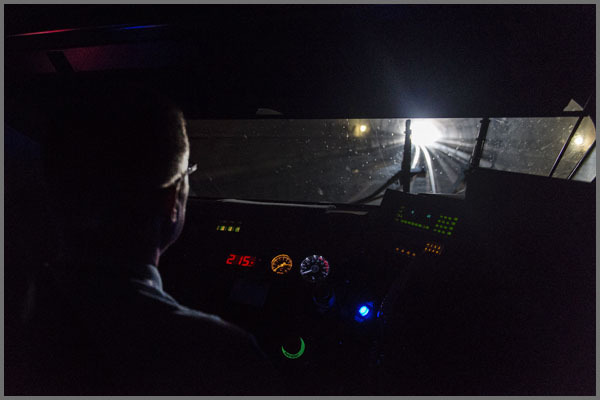 When we were racing though a hill I waited until the light at the end of the tunnel lit the rails and skimmed off the side of the drivers head; The colourfully illuminated control panel gives the rest of the context and the brain fills in the missing picture details… I’M ON A HIGHSPEED TRAIN!